Over the Air (OTA) is the oldest technology that has been used in Canada, USA , Europe and Asia since the 1950's. With technology changes OTA has taken a huge leap forward over the last year or so. The major change is that the old style analogue transmitters used to broadcast the signals over the air (OTA) has gone digital making a dramatic improvement in reception now known as DTV (Digital TV). This new digital feed is so good it is far superior to cable and satellite TV. These signals have changed so dramatically from VHF (snowy) to UHF digital (DTV) that over the air (OTA) HD is even better then any digital cable box or satellite could offer, as OTA HDTV has little to no compression and the picture quality is breath taking. Here in our new Mississauga retail store we have connected an Antennas Direct DB4e or DB8e OTA Antenna to our new Sony HDTV with a built in ATSC tuner and are receiving close to 30 digital channels in crystal clear vibrant picture quality and most of these channels come in on stunning HDTV quality! Channels like CityTV, CTV, CTV2, Global, CHCH, CBC, Omni 1, Omni 2, TVO, CTS, NBC, NBC weather channel, NBC Retro TV, CBS, ABC, Fox 29, Fox Music, CW23, Bounce, WNED (PBS), Think Bright, MY Buffalo, Ion Life, ION Shopping Channel, Qubo and many more most in HD. These broadcasts are coming from towers in Toronto, Hamilton and various towers in Buffalo. When it comes to paying for basic cable and still not getting a digital picture or HD, and then paying monthly for HD and still not getting the quality of OTA, it makes no sense. Once you have made the investment in OTA then you have no monthly bills, and you will receive your basic local networks at much higher quality and if you have a HDTV you will bring out the best picture capability from your expensive TV. Finally Over the Air ( OTA ) gives us a real alternative to paying for basic cable services. Not only does it give us another choice for basic networks but the picture quality is far superior to and cable or satellite service. The greatest advantage of OTA is there is no monthly fees and you get HDTV! With the digital transition taking place currently the number of DTV channels being broadcasted over the air will increase in numbers and broadcasting power. Welcome to the wonderful world of over the air OTA HDTV. More and more people are taking the leap into OTA and saying goodbye to monthly bills for basic television services and are grabbing what is free and in the air in stunning digital and High definition quality. Our motto is an antenna on every house in Canada. Come to our Mississauga retail store and see our OTA HDTV Antenna setup and get ready to see breath taking HDTV. Our retail location is powered by Save and replay's OTA HDTV solution. With no monthly bills from television companies and stunning digital quality that brings cable and satellite providers to shame. Furthermore our OTA solution is running in our showroom with a full EPG (Electronic program guide) on our TV. Yes OTA broadcasts a program guide. Be warned if you do come to our showroom this experience will be shocking and extreme and will make you wonder why you are paying for basic cable services and why you are not receiving the same quality we are. What do i need to take advantage of OVER THE AIR ( OTA ) digital or HDTV? Firstly you need an Antenna optimized from UHF not the old fashion VHF, then you need a television to receive these signals, a newer branded name TV purchased within the last couple of years usually has a built in ATSC tuner to receive these newer digital signals, sometimes also referred to as a QAM tuner. If your TV does not come equipped with an ATSC tuner then you can purchase a digital converter box which acts as an ATSC tuner to allow you to receive Over the Air ( OTA ) UHF signals or DTV (Digital TV). 99% of newer brand name HDTV's should have a built in ATSC tuner sometimes referred to as QAM tuners. This is different from the older traditional NTSC TVs. An ATSC tuner allows you to receive UHF broadcasts once connected to a good quality antenna and receive digital over the air (OTA) HDTV. HD quality better then any satellite provider or cable provider can ever currently bring to your screen. That's right OTA HDTV is better then any other form of broadcast currently as it has little to no compression. If your TV is an older TV, without an ATSC tuner and even a regular non HD tv, then you cannot receive UHF broadcasts in digital and will only get any VHF broadcasts over the air (OTA), which means you will get a snowy picture. However if you connect your antenna to a digital converter box like the channel master 7000, then connect your converter box to your TV. You will receive these UHF broadcasts in Digital crystal clear picture, better then cable or satellite, but not in HD as your TV is non HD. What Channels can i pick up? To see what is possible for you area by postal code, choose local Antenna click here enter your postal code or zip code and then select Local Antenna and you will see the amount of possible channels you can receive with an OTA (Over the Air Antenna) . Please note this link is OLD still as more and more channels have been added to this line up and using products like the channel Master outdoor antenna it gives you more range or radius to receive more channels then say an indoor Antenna. See the channel Line up from Toronto GTA area. Does the antenna i choose matter? Yes of course it matters, You can in essence, get a coat hanger and put it at the back of your TV into your antenna in of your TV and you maybe lucky and get some OTA (over the Air) TV, also buying a cheap antenna usually sold anywhere between $25 - $50 like the digiwave (Antra), Eaglestar or multistar may get you some stations if you are lucky, but these are very poorly constructed and cheaply made antenna's from a company that makes and tries to copy every solid product. Selecting an Antennas Direct, Channel Master or Winegard antenna and dealing with a companies that celebrates 65+ years in making nothing but Antenna's the quality and the difference in price is minor compared to the substantial difference in results. The cheaper made antenna's work only slightly better then the coat hanger method. Choosing between a 4 bay antenna and 8 bay antenna varies depending on distance factors, and terrain (high or low ground). The Antennas Direct extended 4 bay antenna DB4e is rated at 60+ miles which they over exceed especially when going across water like a lake and their 8 bay Extended tange DB8e antenna extends to 70+ miles. Going back to TV antenna's sounds so old fashion something grandpa used to do or people that live in the sticks? Yes it does bring back some memories of the old days, but those used to give terrible picture quality looking very snowy and not digital quality, well we are in a new era, now you can get better quality then regular cable providers that try and get as many channels through one cable and now also the internet and even the phone from one cable. OTA is digital quality and far superior then regular cable providers and because it is uncompressed it is even better then satellite quality. where stuffing too many channels into a cable causes too much loss and poor quality. Yes there is some loss in OTA and weather can effect it but it is digital quality and reception does vary from area to area. Nonetheless its all Digital quality and its absolutely free! Not only is it free and legal but you can also get some HD as well as digital standard definition Television with better quality then your cable provider can deliver to your home. Antennas very and some people have reported great success with some of the old fashioned style antenna's that grandpa used to use with a signal amplifier known as a preamp. To Guarantee even better success with OTA the outdoor antenna's either 4 bay or 8 bay have dramatic results from major manufacturers like Antennas Direct, Channel Master and Winegard. To see the Antennas Direct bay technology antenna running in Mississauga, visit our showroom and take a deep breath as this will change your view on these HDTV antenna's and make you wonder why you are paying for cable TV. It stands for Over The Air television reception, as has been available free-of-charge in Canada since the early 1950s. It is not to be confused with FTA, which is a form of satellite TV reception. OTA is broadcast either in old-style Analog or in new Digital television (DTV, which includes HDTV). The quality improvement of DTV is huge. The Government of Canada has set the date by which OTA broadcasters must convert their old-style analogue transmitters to new digital OTA broadcasting: August 31, 2011. Canada uses the ATSC (8VSB) standard used in the U.S.A., Mexico, South Korea, and Taiwan, with more Western Hemisphere nations expected. ATSC is not compatible with the DVB-T standard used in all other countries except Japan, which has its own ISDB-T standard. Most of our Canadian customers that have purchased a decent Antenna, have spent between $50 to $150 to receive over the air broadcasts in UHF Digital format. These customers have already made the investment in a New HDTV, and most TV's purchased in the last 18 - 24 months have a built in ATSC tuner and the purchase of a good quality Antenna is all that they needed for this TV. So is it expensive is the question? For one TV to get HDTV and local TV compared to basic Cable, this expense covers itself within 6 Months and you get major networks in HD. And as for our fellow Americans we Canadians love you guys, we live in a colder country and living across the border means we can also get your local TV in DTV and HDTV free of monthly bills from other subscribed providers. If you don't have a newer TV that does not have an ATSC tuner then you would need to also purchase a digital converter box which brings your average cost for one TV between $150 - $300. That's usually 5 - 10 months of basic cable services to get Digital DTV and / or HDTV broadcasts. There have been a subset of our customers that have spent over $300 - $600 and purchased additional equipment like distribution amplifiers and digital converter boxes to enable the whole house to receive DTV on multiple TVs and free yourself from paying for basic TV services and get to watch the best HDTV you have ever seen, with less compression then satellite and higher quality HD! For commercial buildings like motels, hotels, lodging houses and nursing homes the savings have been huge, usually the cost of converting to Over the Air (OTA) digital tv is covered in around 6 months of what they are paying their cable provider for. Also for dental, doctors and the medical offices waiting rooms the cost is very easily justified within 6 months and giving their customers HDTV has worked very well. The channel master 4221 HD HDTV OTA Antenna for over the air (OTA) to receive digital TV (DTV) 4 bays bowtie technology. 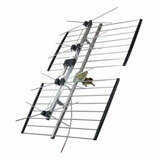 The best money can buy the channel master 4228 HD 8 bay HDTV Antenna with its unique 8 bay antenna from channel master. Switches to split you OTA signal to many TV's also diplexers to combine satellite TV with OTA. Channel Master Motor, Cable, Grounding blocks, mounting pipes and other OTA accessories.